"this release is overflowing with intensity! I absolutely love the two original productions - will definitely play them out - of the remixes, the PIVOT POINT rework is killing it"
A2 is the cut for me on this release! - Really good creepy techno. - Really love the Audio Injection Remix...Full Support ! i like that one. very minus like, or better to say, how i wish minus would be. - really good stuff. great release! like and will play both "the call" and "Dain Brammage" - (originals) thanks! great package… the cell & dain brammage are my fav’s!! 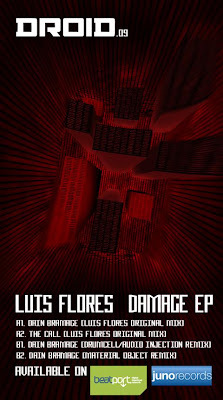 Another dancefloor bomb EP from Droid Recordings, My favourites is Material Object remix. I can’t stop playing it. Publicadas por Bar americas a la/s 9/06/2009 08:20:00 p. m.